Conventional economic inquiry does not always integrate all that science has come to know into its analysis. The reasons for this are many, but the most significant and commonly held are: 1) it may be hard to value what science has only recently learned; 2) whatever the value, it may be so indirect as to be functionally irrelevant to prevailing economic concerns; 3) people just can’t know everything. 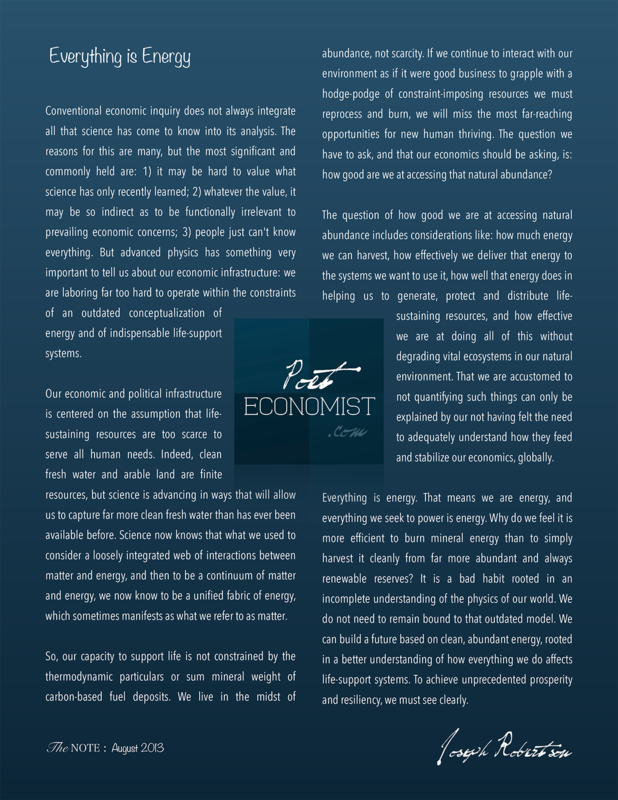 But advanced physics has something very important to tell us about our economic infrastructure: we are laboring far too hard to operate within the constraints of an outdated conceptualization of energy and of indispensable life-support systems. Our economic and political infrastructure is centered on the assumption that life-sustaining resources are too scarce to serve all human needs. Indeed, clean fresh water and arable land are finite resources, but science is advancing in ways that will allow us to capture far more clean fresh water than has ever been available before. Science now knows that what we used to consider a loosely integrated web of interactions between matter and energy, and then to be a continuum of matter and energy, we now know to be a unified fabric of energy, which sometimes manifests as what we refer to as matter. So, our capacity to support life is not constrained by the thermodynamic particulars or sum mineral weight of carbon-based fuel deposits. We live in the midst of abundance, not scarcity. If we continue to interact with our environment as if it were good business to grapple with a hodge-podge of constraint-imposing resources we must reprocess and burn, we will miss the most far-reaching opportunities for new human thriving. The question we have to ask, and that our economics should be asking, is: how good are we at accessing that natural abundance? The question of how good we are at accessing natural abundance includes considerations like: how much energy we can harvest, how effectively we deliver that energy to the systems we want to use it, how well that energy does in helping us to generate, protect and distribute life-sustaining resources, and how effective we are at doing all of this without degrading vital ecosystems in our natural environment. That we are accustomed to not quantifying such things can only be explained by our not having felt the need to adequately understand how they feed and stabilize our economics, globally. Everything is energy. That means we are energy, and everything we seek to power is energy. Why do we feel it is more efficient to burn mineral energy than to simply harvest it cleanly from far more abundant and always renewable reserves? It is a bad habit rooted in an incomplete understanding of the physics of our world. We do not need to remain bound to that outdated model. We can build a future based on clean, abundant energy, rooted in a better understanding of how everything we do affects life-support systems. To achieve unprecedented prosperity and resiliency, we must see clearly.